ZD BLACKJACK'S TUZY is a big bodied red and white paint. This is a very big cow! 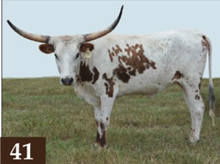 Her Sire is WF BLACKJACK who is out of COWBOY CHEX, PEACEMAKER44 & ROUND UP. Her Dam is LLL GUNSMOKE'S TUZY who is out of GUN SMOKE, WATSON 83 & EOT SENSOR'S TWO EYES. 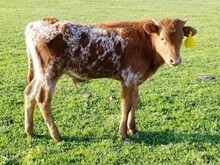 This cow is exceptionally bred!